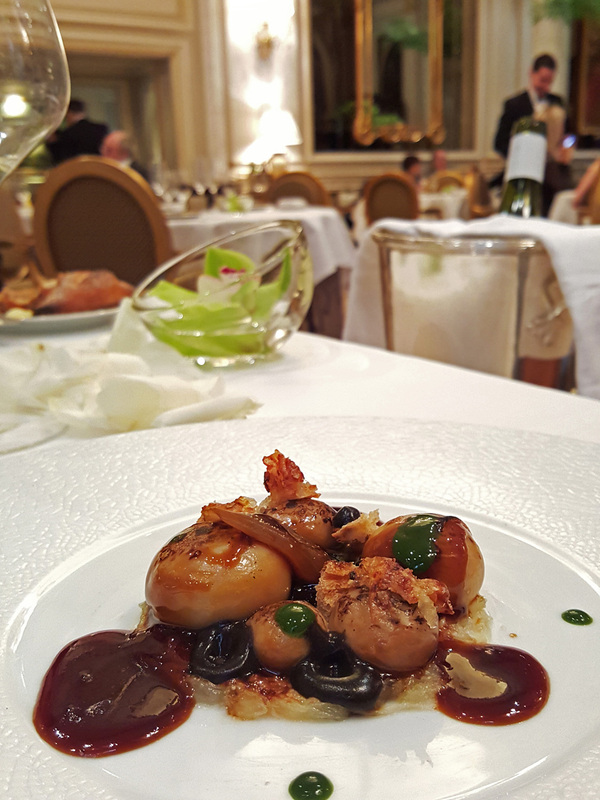 I`m supposed to be a food freak and yet I can`t believe that it`s taken me so long to get over to eat in Paris , the Mecca for lovers of fine dining and the birthplace of gastronomy. My trusty dining partner and ultimate food geek friend Finediningexplorer contacted me and basically issued the orders that it was `my duty as a food lover to go and experience Parisian 3 star dining`.Together we worked out that we could do a weekend of lunch and dinner combinations at the `best of the best` and also throw in an experience of “The Worlds most ridiculously priced and overrated Bistro” (Chez L`Ami Louis). 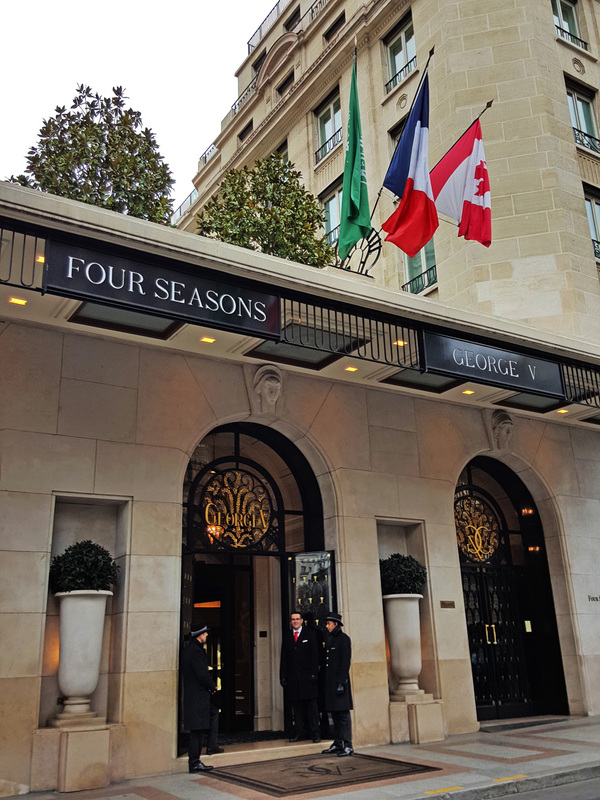 As I had no previous Parisian dining experience I just left the bookings to FDE as he was the expert and had visited the city a few years earlier. 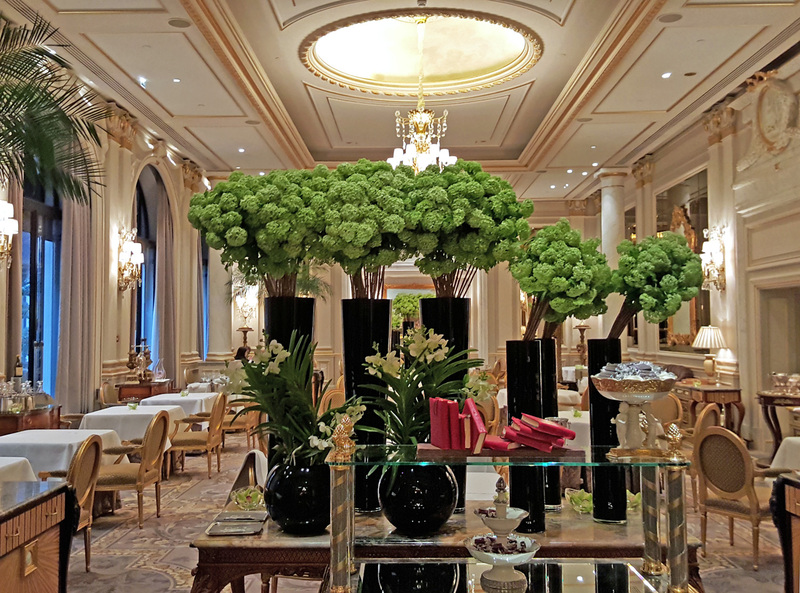 So the bookings were made , Alain Ducasse , Taillevent , Ledoyen , L`Ami Louis , Le Cinq , Le Bristol and finally Atsushi Tanaka (for something a little different). 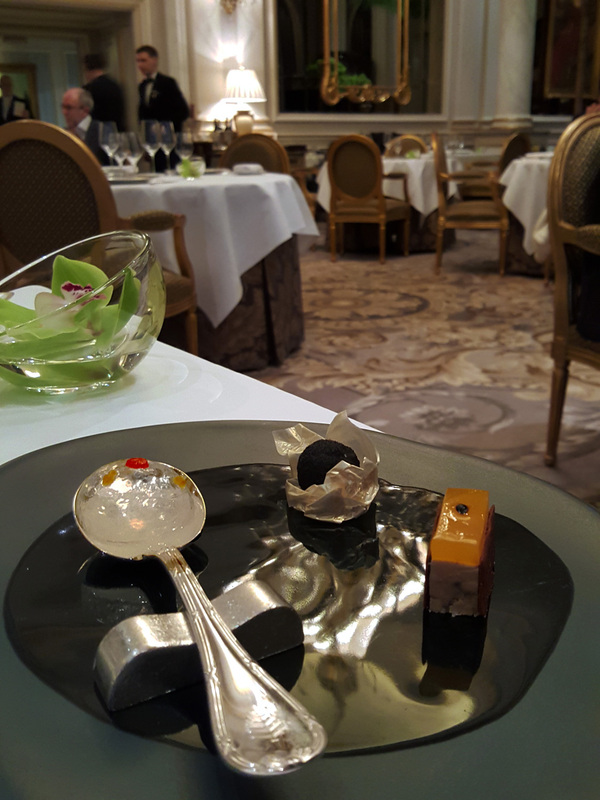 Up to date I`ve eaten some stunning meals in some of the World`s best restaurants but so far I have never actually had what I believe to be a true all round Michelin 3 star experience. 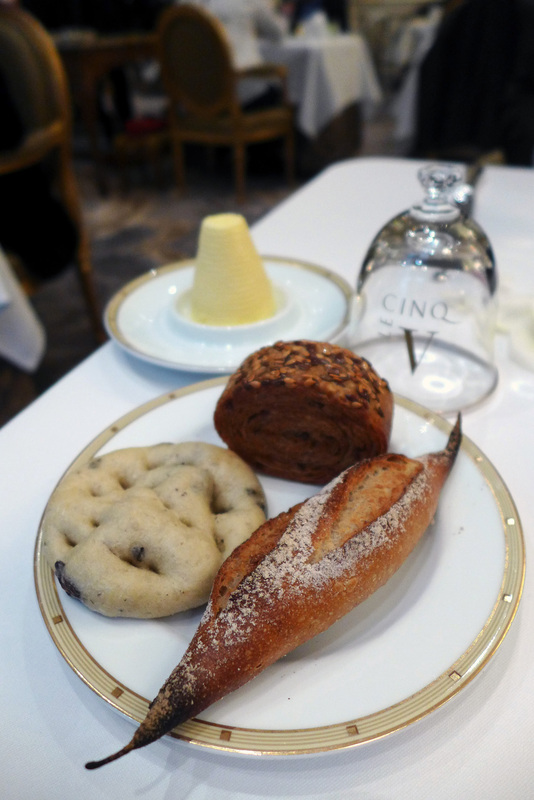 I`ll start with the best meal of the trip ( Le Cinq ) and post the others later. 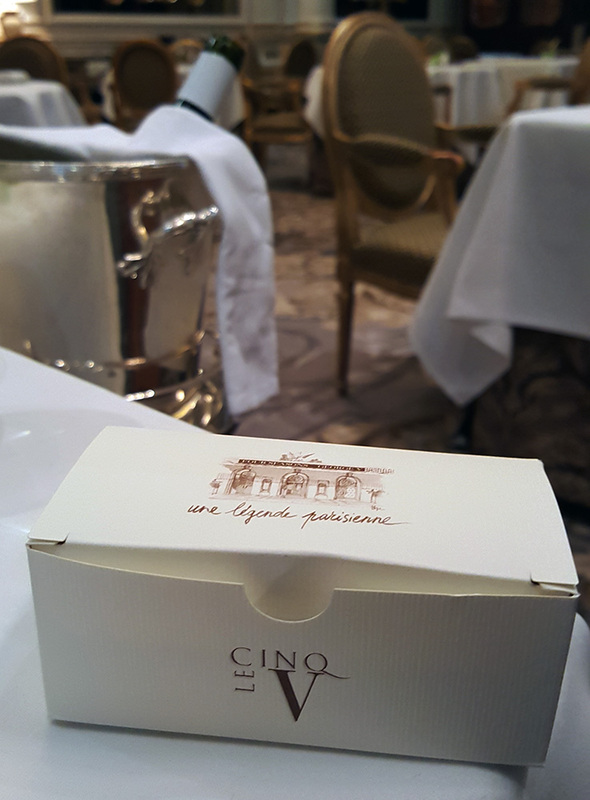 Le Cinq also boasts the title of `Best Sommelier in Europe` .We had hoped to meet the super wine man Eric Beaumard during our lunch for a mini education about his amazing cellar but someone had given him a day off during our visit…..Terrible , so thoughtless and unfair. “Eric , we shall return to meet you very soon”. Ok , so on to the food. 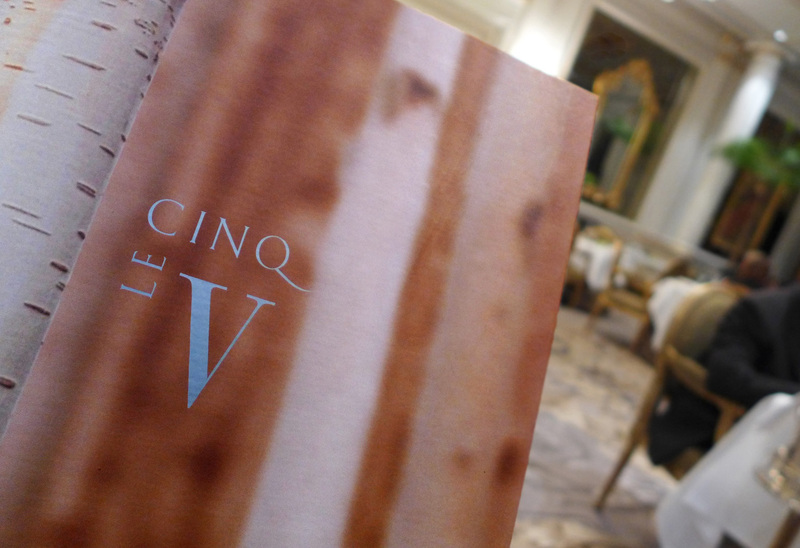 There`s a number of options for anyone wanting to eat at Le Cinq. You can do it sensibly or you can just go crazy and worry about the bill after the meal. 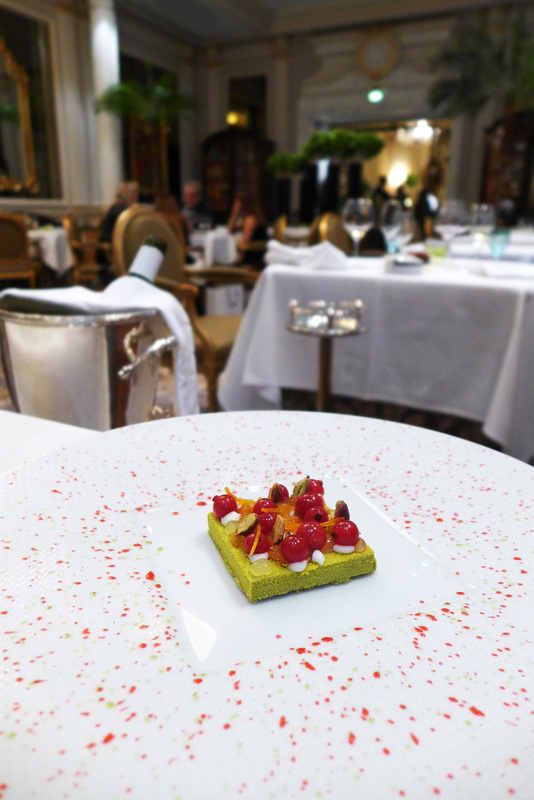 The cheapest option is lunch and the “Seasonal escape” menu priced at €145 ( 4 courses ) or €210 ( 6 courses ). We chose the 6 course lunch below. 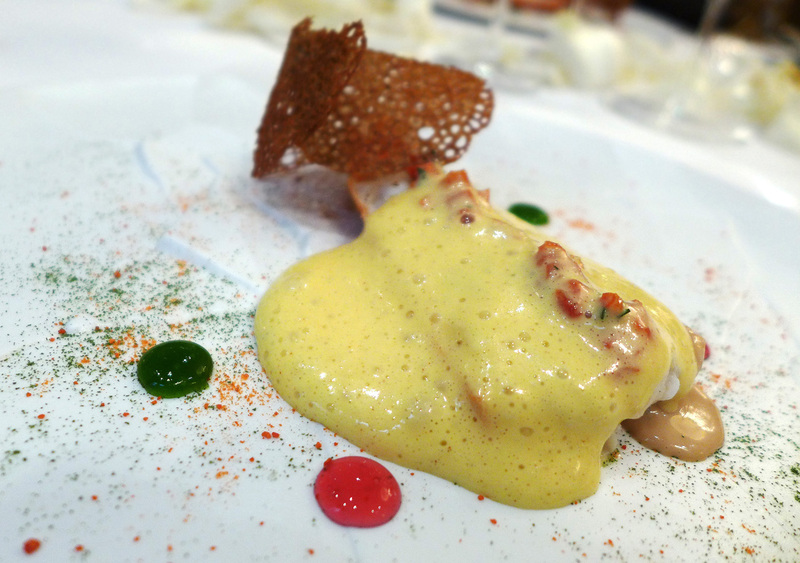 In the evening there`s the “Epicurian Escape” menu priced at €310 ( 9 Courses ). If you`re brave and decide to go ALC then you`ll be paying €70 to €140 for a Starter . €82 to €140 for your Fish / Shellfish course. €82 to €190 for a Meat / Poultry course and €32 to €38 for a dessert. Extremely expensive I know but this is the price you pay for grand Parisian 3 star fine dining cooked by a legendary household name Chef like Le Squer. 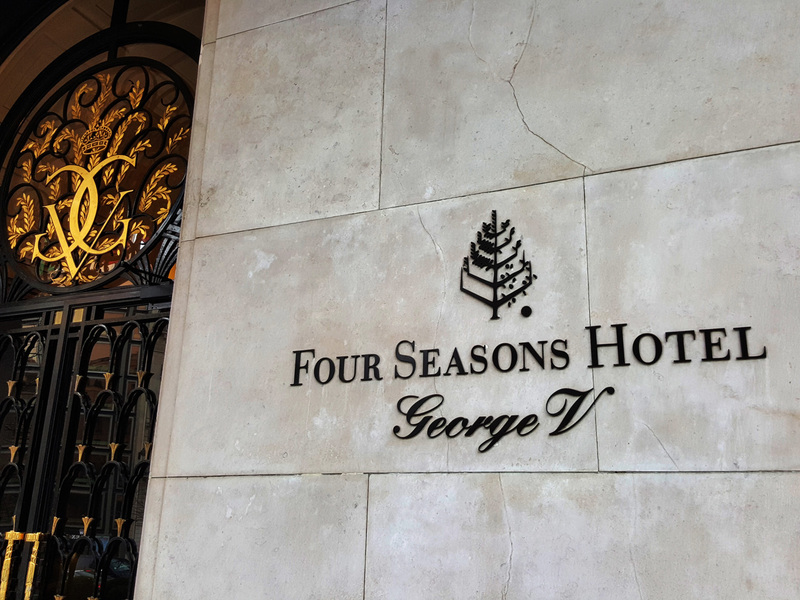 On this occasion we took the recommendation of the house and went for a semi sensible option….The 6 course lunch at €210 with a few wines priced very reasonably by the glass. 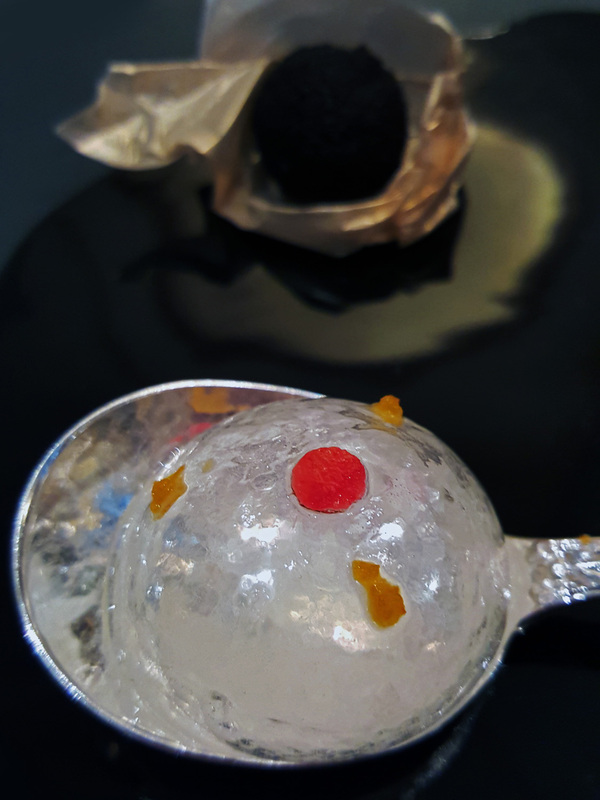 Our “Mises en bouche” – Campari ,Orange and Ginger liquid centred cocktail that explodes in the mouth. 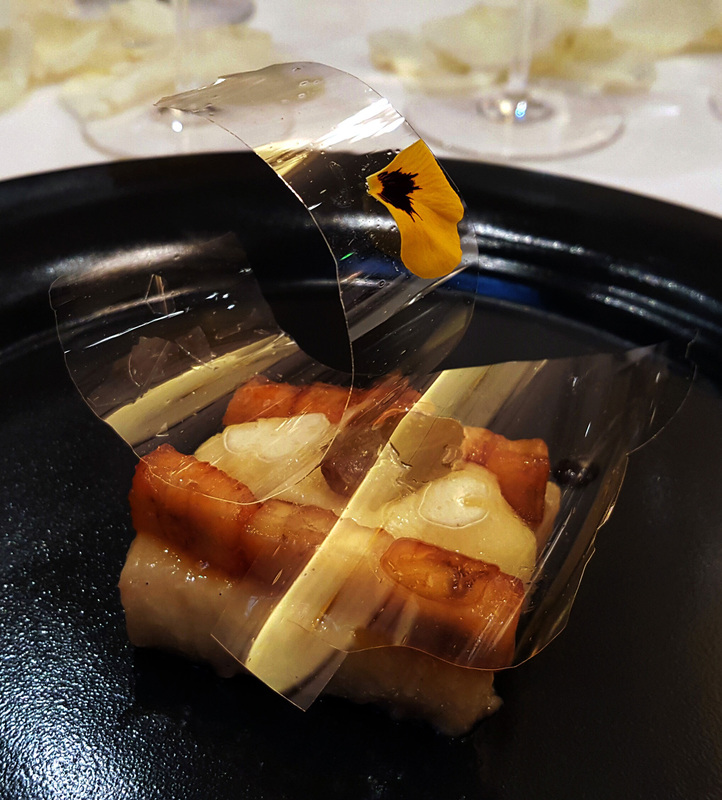 Foie Gras with Passion fruit jelly and a wonderful Black Truffle cream sitting on a Celery and Gold edible wrapper. Foie Gras sandwich topped with a Passion fruit jelly. 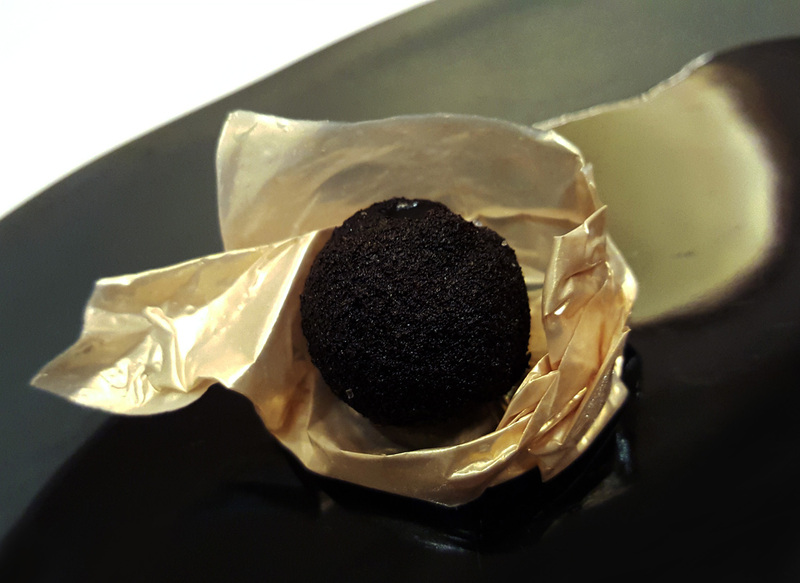 Black Truffle cream sitting on a Celery and Gold edible wrapper. Campari ,Orange and Ginger liquid centred cocktail that explodes in the mouth. 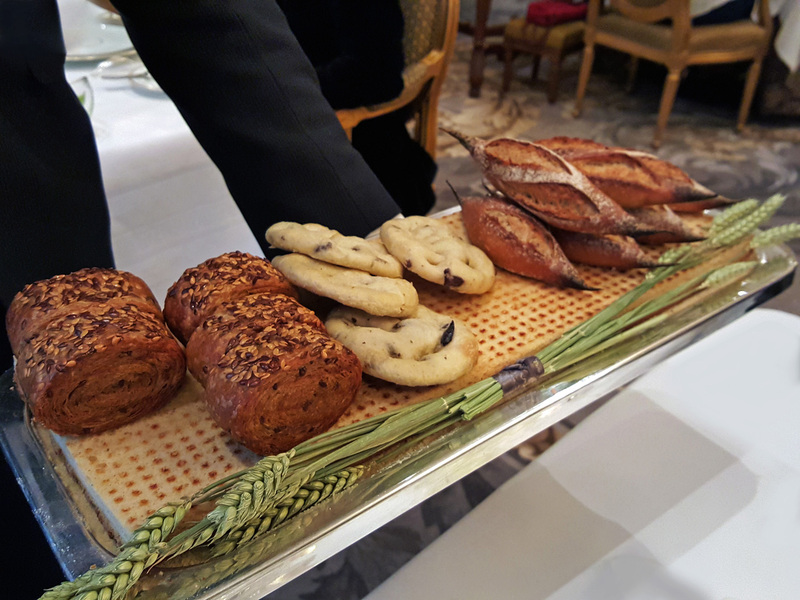 The Bread arrives in style and what better way than to sample one of each. Next treat was a little taster of new seasons Petits Pois. They were served simply sat on a little Lemon Cream with Redcurrant and Mint. 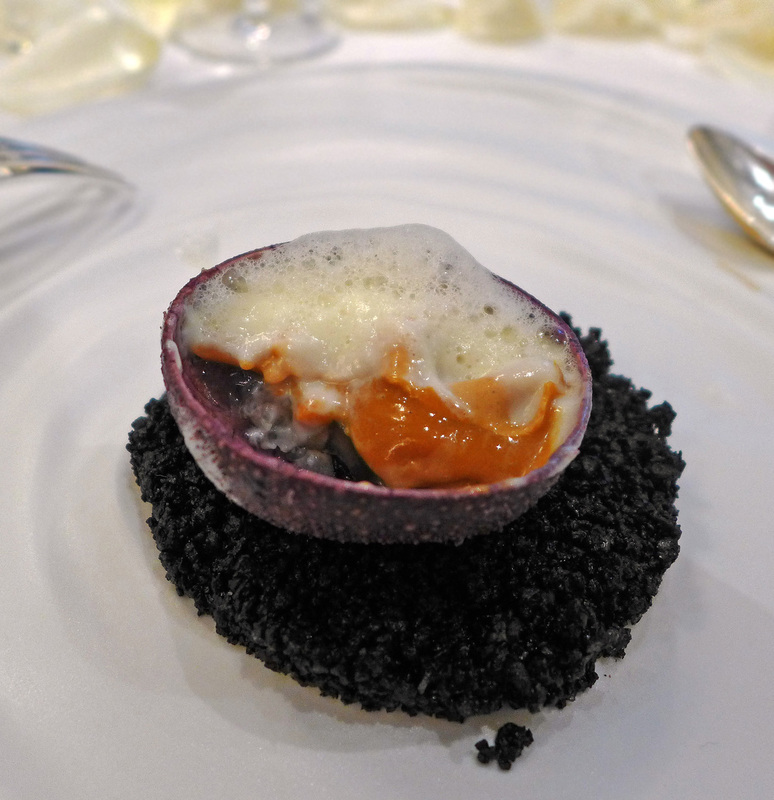 Chaud – Froid Cauliflower and Sea Urchin in its shell. Now I`m not the biggest fan of Sea Urchin but I think that this one converted me. 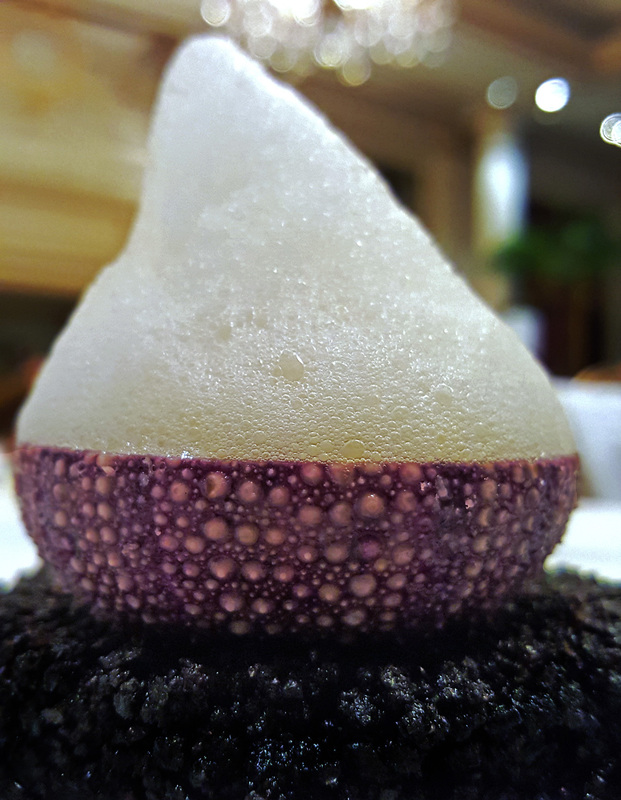 Creamed urchin with Cauliflower jelly and small pieces of Cauliflower topped with a Seawater foam…Stunning. The next dish wasn`t part of our lunch menu. Priced at €140 on the alc menu it would have been pretty breathtaking on the bill. Fortunately chef wanted us to try this and so it came as a complimentary course. 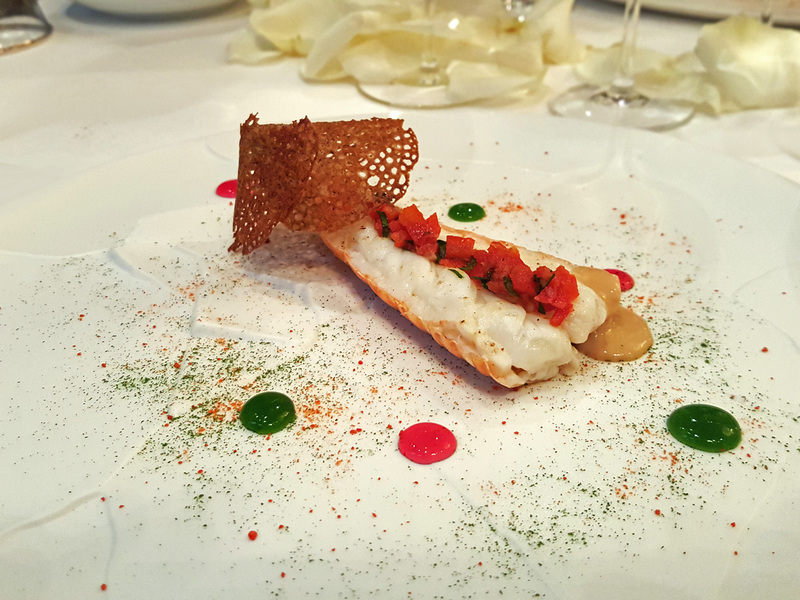 I could have sworn that it was a Langoustine from UK waters as it was so sweet and tender but I was assured with a smile…..”certainly not sir”, it was from Brittany. Served with a Buckwheat Pancake and a warm Mayonnaise scented with a shellfish cream. 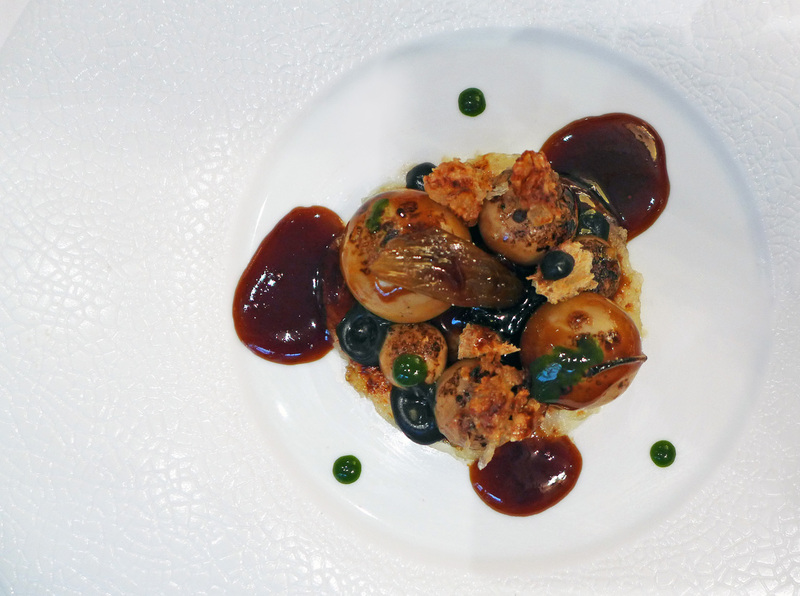 Time for Dreams – Gratinated Onions contemporary Parisian style – Onion balls which were actually filled with a hot Onion broth. Black Truffle , Thyme and crispy Parmesan accompanied the dish along with an extremely robust Onion jus made this our Number one best plate of food over the whole weekend. We both agreed that we would return to Paris just to eat this again. 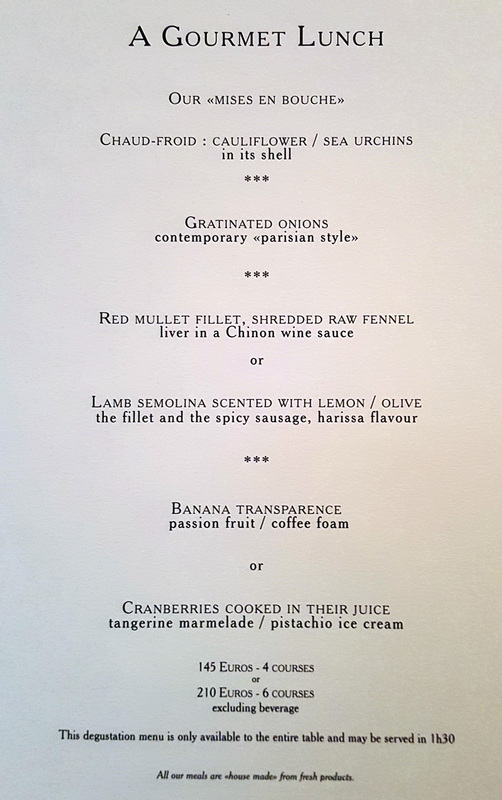 I`ll go as far to say that this one is part of my ultimate menu of the `best dishes of a lifetime`. 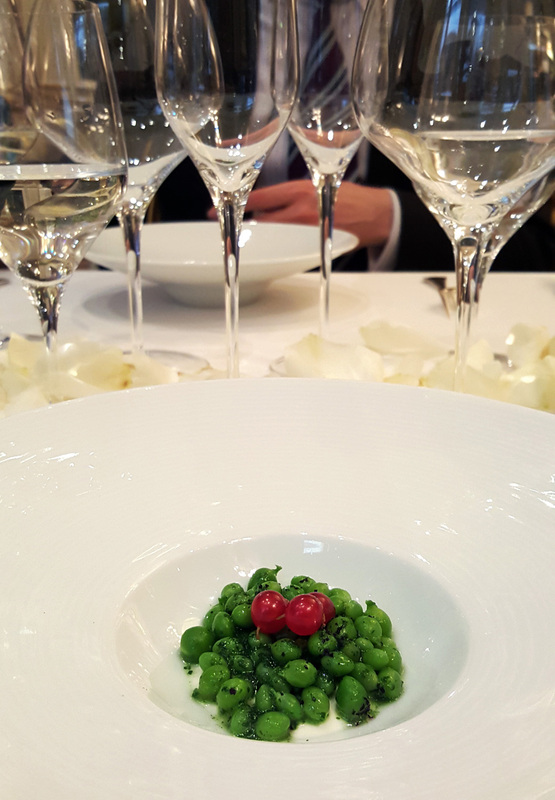 A perfect example of Chef Le Squer and his new approach to the reinterpretation of the conventional codes of Gastronomy. This was priced at €70 on the ALC menu and worth every Euro. 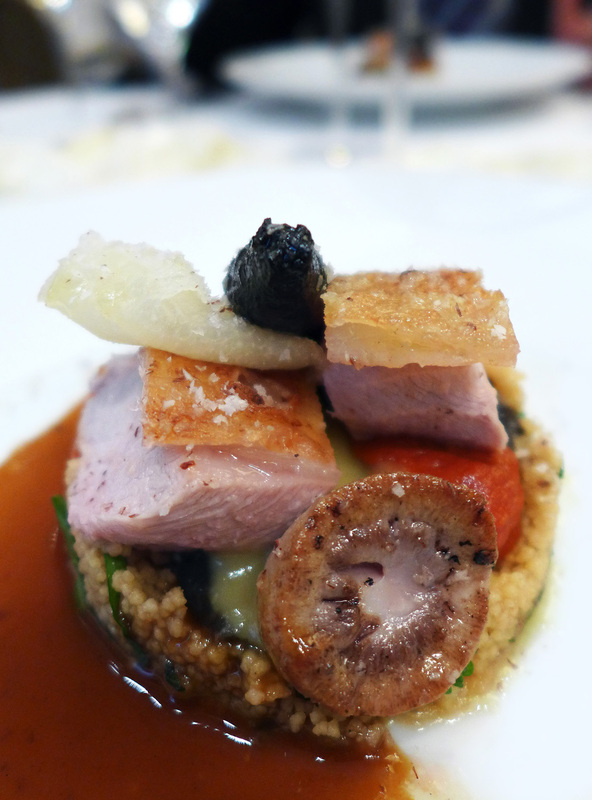 It was paired with an aged Madeira so if anyone is heading to Le Cinq to eat then please ask for this pairing. You`ll be stunned into silence. 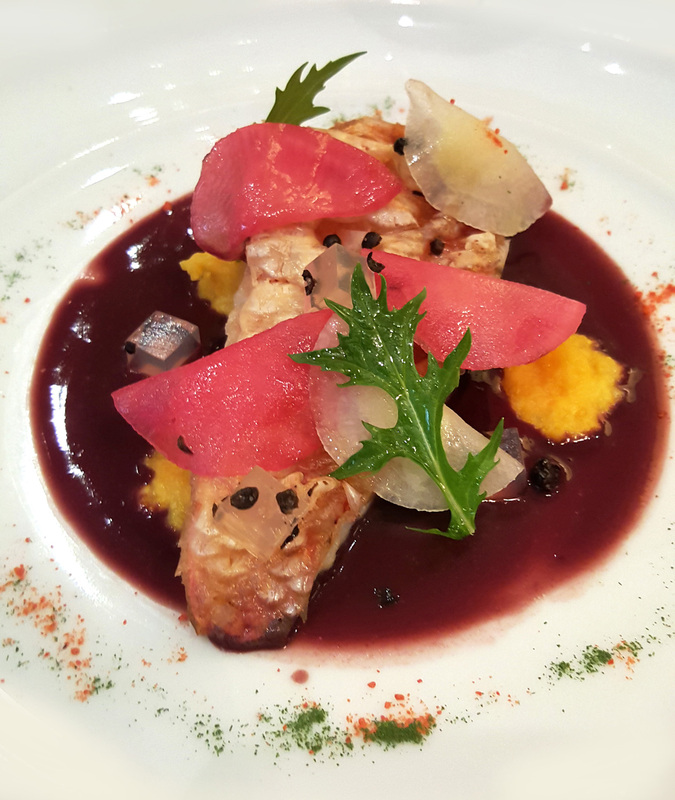 Red Mullet fillet , Shredded raw Fennel , Radish , Orange puree and Red Mullet Liver in a Chinon Wine sauce. New seasons Lamb fillet with Olive and Lemon scented Semolina. Lamb Sausage with spicy Harissa flavours. Check out the colour of the Lamb , barely off its Mothers Milk and melted in the mouth. 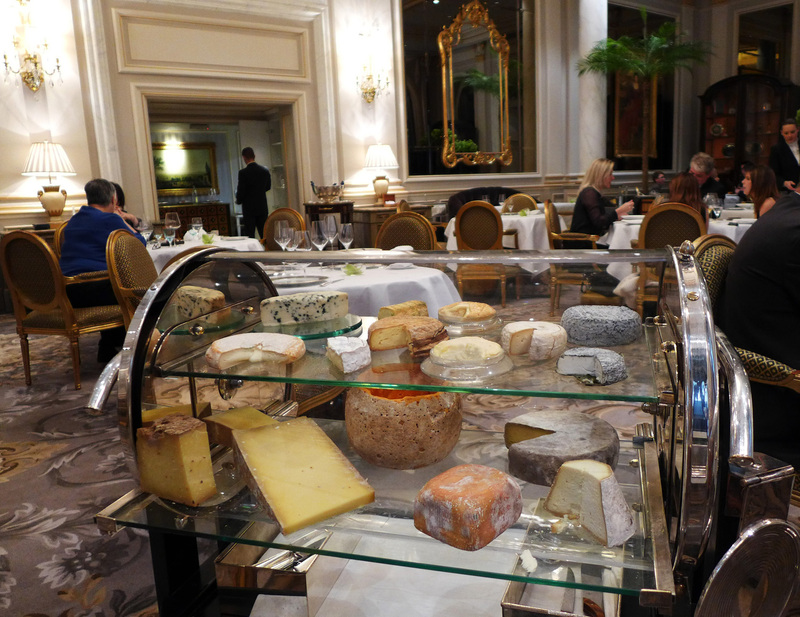 A selection of fresh and ripened French regional Cheeses. 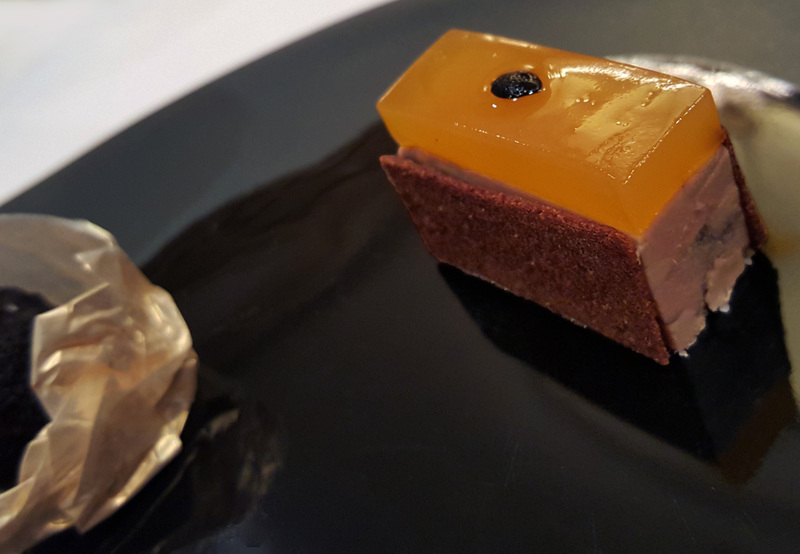 Banana Transparence , Passion fruit and Coffee foam. When it comes to this part of the meal I just want the sweet treats to continue on and on. This dessert just started the show off fantastically. Cranberries cooked in their juice with Tangerine Marmalade and Pistachio ice cream. 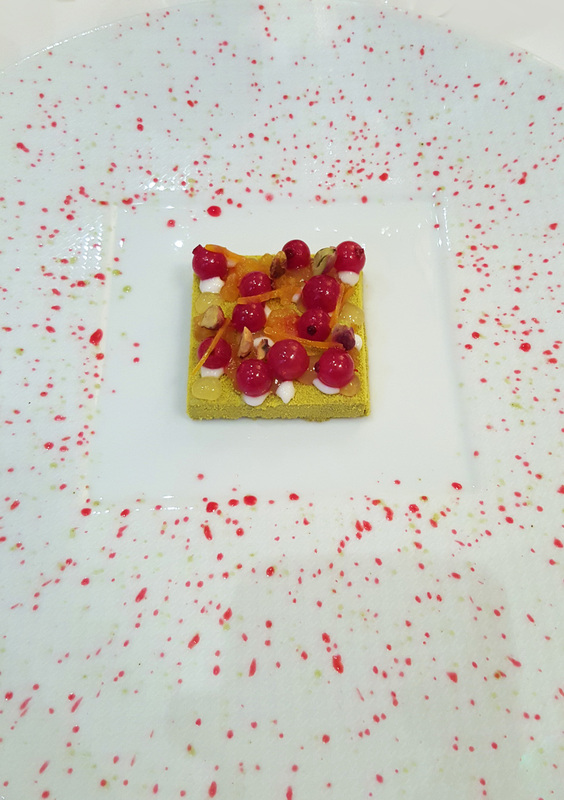 A stunning dessert and I actually though the colours were part of the plate but it was perfect splashes of Cranberry and Pistachio syrup. Beautiful art on a plate. 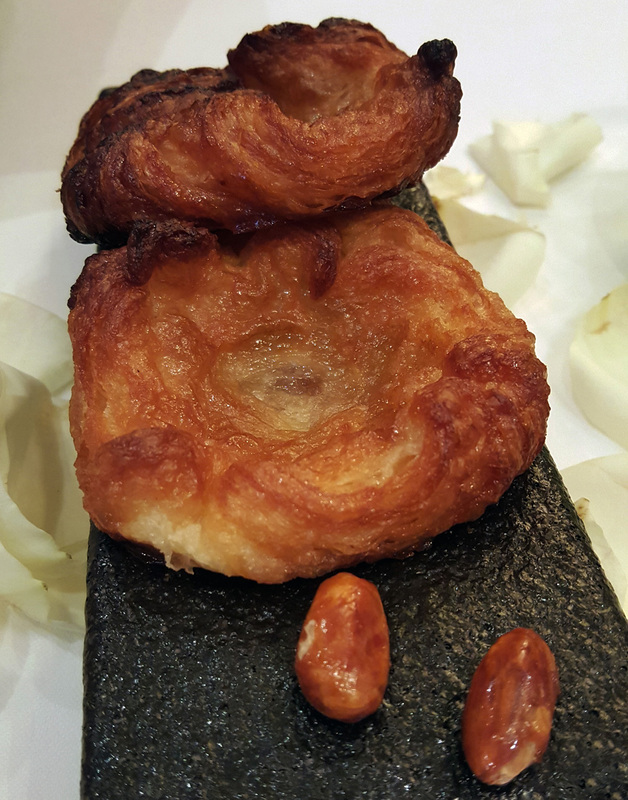 Kouign –amann – Wow , another course arrived. This one was a traditional Breton cake made with a Bread dough layered with Butter and Sugar. A bit like Puff Pastry but with fewer layers. 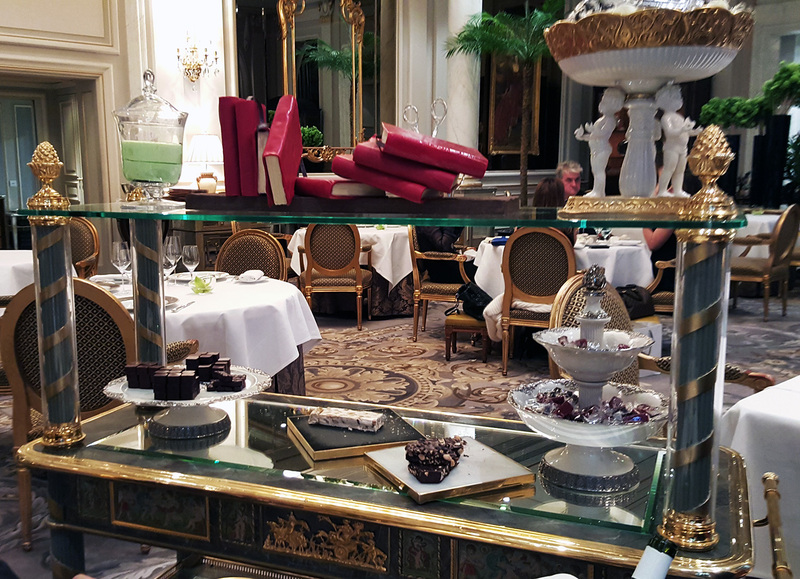 Sweet treat time – Not a big selection to choose from but I couldn’t resist the Absinthe Marshmallow and a few Truffles. 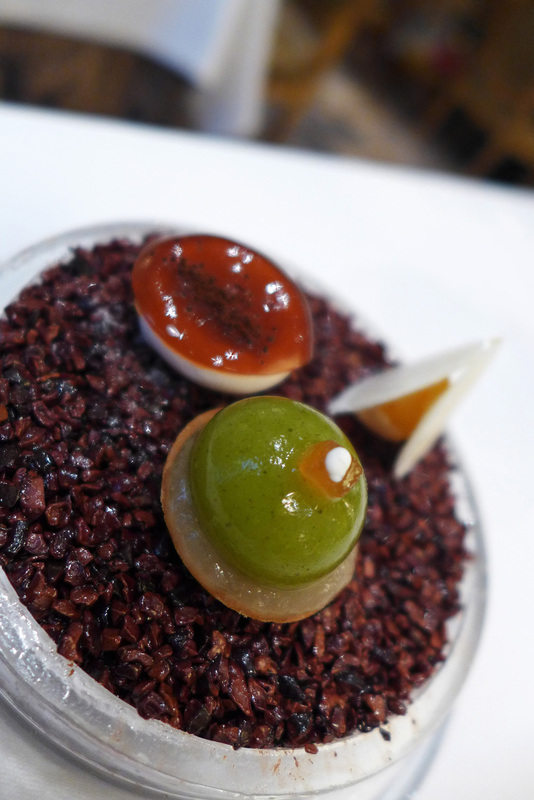 Apple Fennel tart , Orange pate de fruit and Caramel meringue arrived unexpectedly and were gone in a flash. Oh and just incase we thought we were escaping without something to take home.This little box of delights arrived with a chilled bottle of Abatilles , the purest Water in the world. 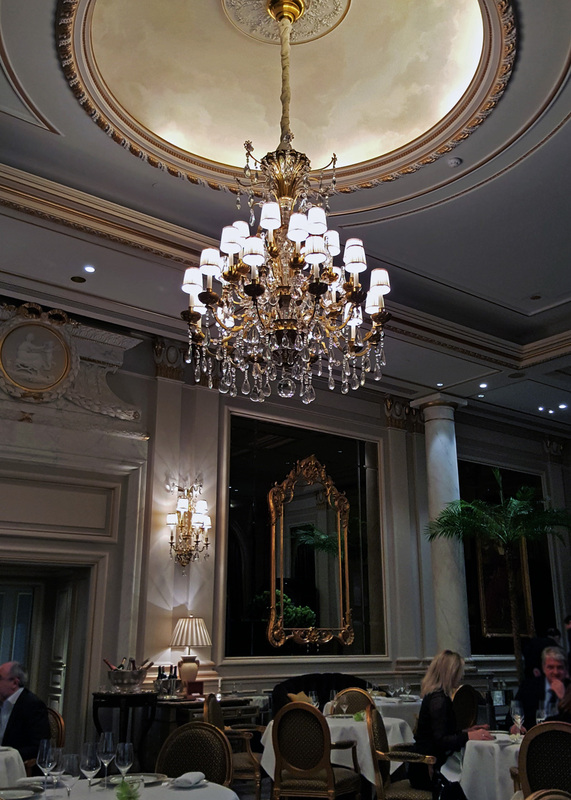 World class water ,world class service….and the food , WOW. What a treat this lunch had been. My first true 3 star all round experience in all of my years of dining. I`ll be back….very soon, I`m craving those Onions so badly already. Previous Post Forest Side , The Lake Districts multi million pound hotel opens. Next Post The Water Library , Bangkok. Now THIS is my kind of food; creative yet not overdone. Nice to see them also not following the herd with geometric shapes on every single plate. New site layout looks great. Love this site!